Excited to be bringing two products into the Canadian market, Maxwell Foods needed to update its packaging to meet Canadian requirements. 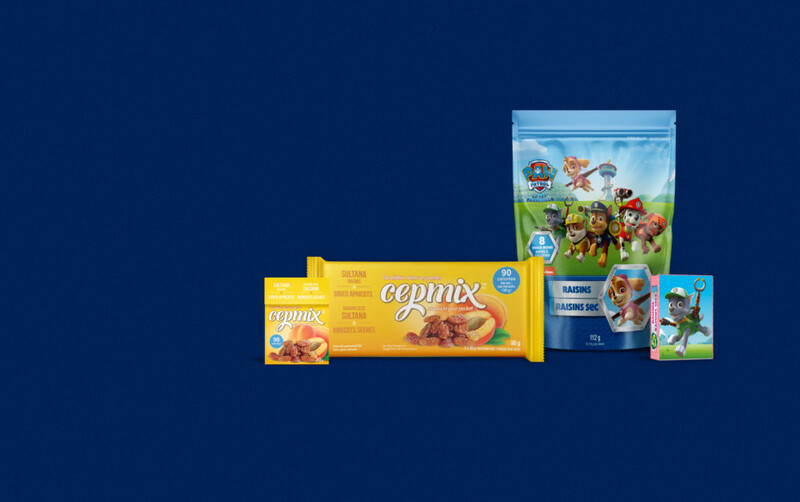 The two products, Paw Patrol Raisins and Cepmix, were planned to ship in a relatively short period of time and turnaround times needed to accommodate their timeframe. Starting with supplied UK packaging, we first began with updating the Paw Patrol Raisins for the Canadian market. Freshening the layout to continue featuring the Paw Patrol characters, we incorporated the French language requirements on all of the pieces – individual boxes, cellophane wrap, doy bags and shelf casing. Because the Paw Patrol characters are a licensed element, we liaised directly with Nickelodeon to ensure their logo and character usage followed their branding guidelines. When you are presenting such well known television channel and its characters, it’s important that what is seen on the shelves matches with everything else – those little people are sticklers for the details (not to mention the higher execs!). 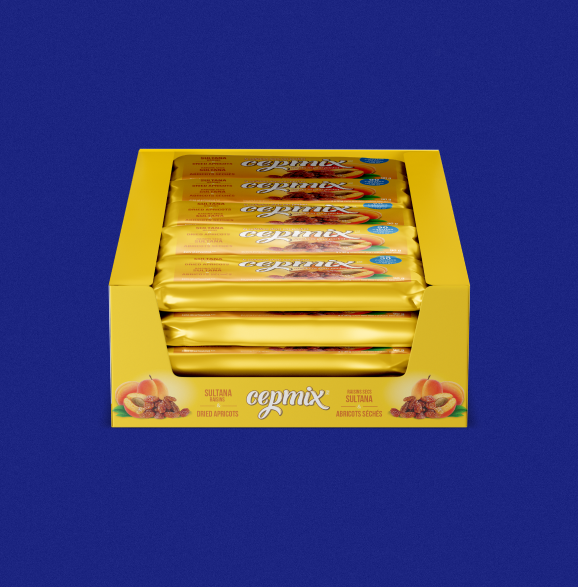 Next we moved onto the Cepmix packaging, a new, single serve adult snack of dried fruit and nut combinations. As a new product in the Canadian marketplace, the goal was to present a fresh product package while keeping true to the brand already established in other countries. After recommending an updated colour palette for the 3 different varieties, we again adjusted the elements to incorporate the French language requirements. Subtle changes were also completed to enhance the ingredient imagery and appeal to the target demographics for the product. In addition to the packaging updates, we also coordinated all of the French translation services. With discussions underway to place the products in Loblaws, Shoppers Drug Mart and Walmart locations and no updated product imagery to share, actual size mock ups were created and supplied to support finalizing the distribution channels. We also helped prepare product image files for the retailer’s product systems – making sure the best quality images are available for the retailers to use in their promotional materials. Both the Paw Patrol and Cepmix products are soon to be available in Loblaws and Walmart locations. With all of us committed to healthier eating for ourselves and our families, we are looking forward to having both the Paw Patrol Raisins and Cepmix snack boxes available to include in our lunches!